The direct reason for this post was Larísa's about an account hack and subsequent bank-cleaning. However the reason why I dislike guild banks is not only the chance of account hack, though it's a good reason by itself. If I don't guard my account with proper security measures, that's my fault. However I can't make others guard their account, and my share of the stuff disappear too when his account is hacked. The reason is also mostly not the frequent guildbank ninja actions. Anyway ninjas are frequent enough to be a good reason for not having guildbanks by themselves. Still, guildbanks not only exist but came to existence for players request at the first place. Before Blizzard implemented them, the guilds have banker officers who hoarded and managed the stuff of the guild, so people do want to have them. At first, why do I think they are bad? Because there is no such thing as guild-owned stuff. The "guild" cannot own anything since it is not an existing entity. The "guild" cannot speak, don't "want" things, don't have ideas or feelings or anything. It's just a list on a piece of (computer simulated) paper. Of course the guild leader does have ideas, feelings and wills. So do the officiers, and every single members. However these do not form some kind of new or unified will, just like your ideas and your neighbor's does not form the "will of the country". The last two points can be handled very simply: don't have guildbank. Every loot from raids should be distributed among the raiders by some mutually accepted loot distribution system. One could claim that this case certain fights would became impossible. For example Mother Sharaz needed shadow resist gear created from Heart of Darknesses. The HoD was given by Hyjal and BT trash. It was usually collected in the guild bank and when Mother was reached (and the HoD-s were not ninjaed yet) shadow res gear was created for the raid. However if the same HoD-s were distributed among the same raiders, they could create the same gear. Of course some would sell their HoD-s, and would end up with no shadow res gear but such immature players can be kicked from any serious guild (and unserious guilds had nothing to do with Mother). So the guildbank as the mean to save individuals from their own mistakes is a lame excuse. However there must be a reason for their existence. The reason is the "us" feeling. Some people, mostly kids, don't feel themselves strong/efficient/worthy and want to meld into a group. I am maybe week, but we are strong. We have 20000G, 100 HoD, 250 voids, 100 epic gems, we rock! 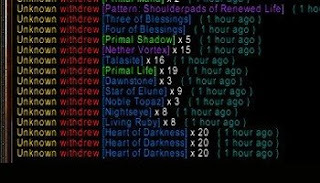 Of course these items can be used by only one person at a time, so if it's distributed equally for usage in a 25 man raid, we fall back to 500G, 4 HoD, 10 void, 4 gems, which is less than the fortune of most of us. However the feeling to have all these stuff is good. It's very funny that now, before Wrath comes out, the carefully collected items are dumped into the AH for coppers. These people need to grow up or visit a psychotherapist instead of having a bank. The only good reason for a bank is having cheap but hard-to-come-by items, like limited stock recipes, recipes sold by distant vendors, rarely used tradeskill stuff like Chimera leather or Felcloth, some consumables for emergency usage with strict put-them-back-tomorrow policy. While a guild may not have a "will", why can't it own things? How is it different than a company? The CEO has a will, as do the officers and board members, but the company does not. But the company CAN and does own things. Even though there may be logical reasons that speaks against a guild bank I can't help thinking that it's got a sort of symbolic value. 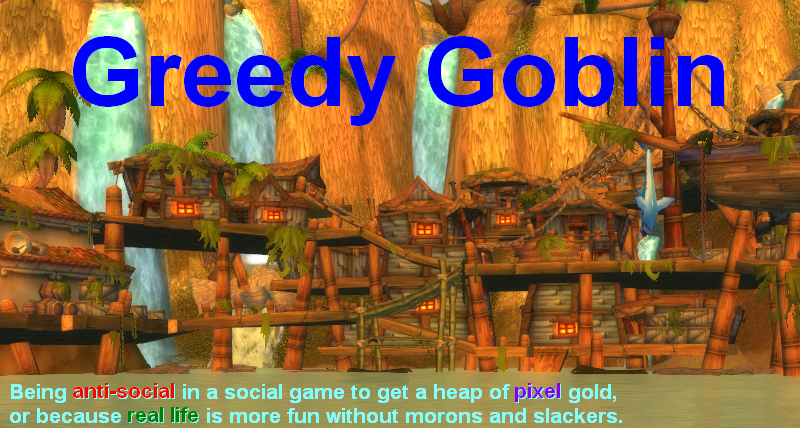 It contributes to the feeling that you're a part of a guild working together towards a common goal, not only a hired legionary (the goblin method, which have it's advantages, admittidly). Of course it doesn't build community feeling in its own, it's just a small part. Other things are more important, such as a guild forum, vent, a lively guild chat, communications over all. But still it's got a function, in my opinion. At the same time it MAY mess up things a bit. How do you keep track that you donate about as much as you pick out? Especially when AH prices are fluctuating. It can make life a bit complicated if you compare it to be independent, minding your own business. Just for the record i dislike guild banks i dont put much in and dont expect nothing out. @tal: companies have an owner (or several stockholders). What the company "own", actually the owners do. @larísa: You are completely right, but this is exactly the "us" feeling that finally cause the stuff wasted. Removing it from the "common bank" and give it to an individual feels wrong, so it stays in the bank until become obsolate and useless. Companies have owners, and guilds have guild leaders. The leader, having full control over the guild bank, is just like the owner in a company. Well, at least as much as anything in a virtual world can be "owned". Of course, there are differences, mostly because a real company has to be regulated, but in general I think the comparison holds pretty well.